The only way is by boat. 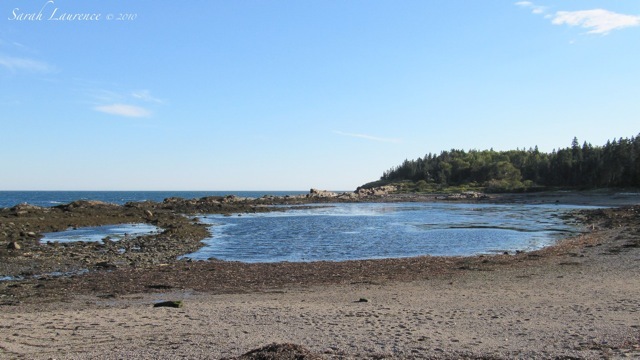 To Maine’s largest tide pool. And a forest of windblown pines. Your posts make me most homesick. Love em all! What a beautiful place! I love the idea of going somewhere only accessible by boat. Did you motor or sail? what a lovely place!Wish I was there. Ahh! This is one of those places I wish we'd had more time to visit. It looks like you had a perfect day for boating. Lovely pictures! Had some friends who just got back from Maine and they were sharing stories of how beautiful the area is--also the food was great. Peace and tranquility. How lovely to go to such a secluded, nature-filled spot. All, my dog is ill so I won’t be online much this week, but I’ll come visit when I can. Tina, you were lucky to grow up here. JAPRA and ACIL, we came in a friend’s powerboat on Labor Day. Their son is pulling the anchor and my son is standing in the water. Two brave young men came in that wooden sailboat (there were big waves after the hurricane) and were camping there overnight. 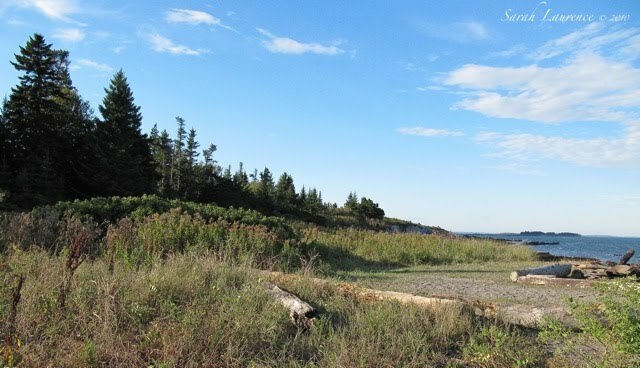 There’s an island trail with campsites in Maine. Ingrid, welcome to my blog and thank you! W2W, Tracy and Alyson, it was a perfect day. Dear Sarah, This is just like a modern day Robinson Crusoe moment with so many unnhabited islands and just you and the boat. The seascapes you give are always hauntingly beautiful. Heavenly! Your photos convey the enchantment of the islands, forest and water. Beautiful! Edith, it did felt like our children were in a storybook. They are lucky to grow up in Maine. Lovely photographs Sarah. Will you use some of these over the winter as templates for watercolors? I want to go there! I like these lovely poetic posts you create. Gorgeous!!! Makes we want to head there right away! Bonnie, I paint on location during the summer and early fall. During the rest of the year I take photographs and write. I have never painted from photos. The camera lens sees things differently than the human eye. Some landscapes work better as paintings and other as photos. Often paintings from photos look frigid or distorted. I enjoy the meditative quality of painting in nature. Donna and Kelly, thank you! Except for the rocks, this looks very like our Lake Michigan coast. Beautiful images and blog. Thank you for connecting after Bonnie's post. It's nice to meet you! Lovely! Looks like the perfect place for a quiet retreat. i love that rough, rocky landscape and you capture it so perfectly. i wonder what amazing creatures you find in that tidepool? I've never heard of Jewell Island, but it looks like an amazing place. I love the concept of islands--the isolation. Beautiful photos--the last one is my favorite. That looks like such a special place. I do enjoy going to the shore at this time of year, as we get our local beaches returned to us after Labor Day. The water is still plenty warm for a swim and the restaurants are much less crowded. For your beautiful Maine seascapes this landlubber is both enchanted and a bit frightened. The vastness and power so close by is an unknown factor to me. Thanks for sharing though. Ruth, welcome to my blog and thank you! The northern climate must be the explanation for the similar landscapes. It is a pleasure to connect with you through Bonnie. Rose, it wasn’t exactly quiet with 5 kids, but it was fun. Amanda, the most amazing creature I’ve ever found in a Maine tide pool was a bright red starfish. We found a lot of green crabs (invasive species) and periwinkles. 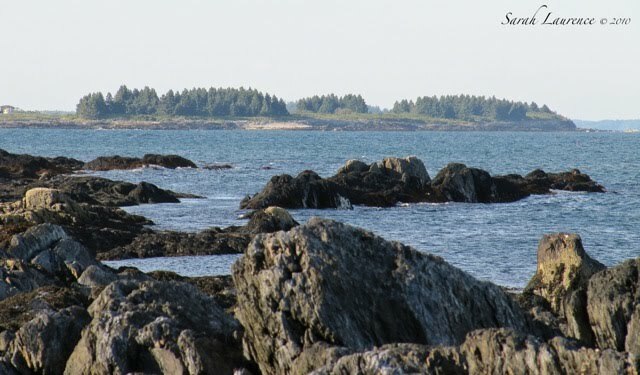 Cynthia, Jewell is one of many deserted islands in Casco Bay. I’m drawn to islands too. Les, it is nice to have empty beaches again although our water is a bit too cool now. A beautiful calm place! It looks like a secret place; somewhere only you know and no one else visits! How fantastic! When reading your previous post, it was lovely to find that your painting has had an influence on your writing!! The Maine Tourist Board should be paying you, Sarah. 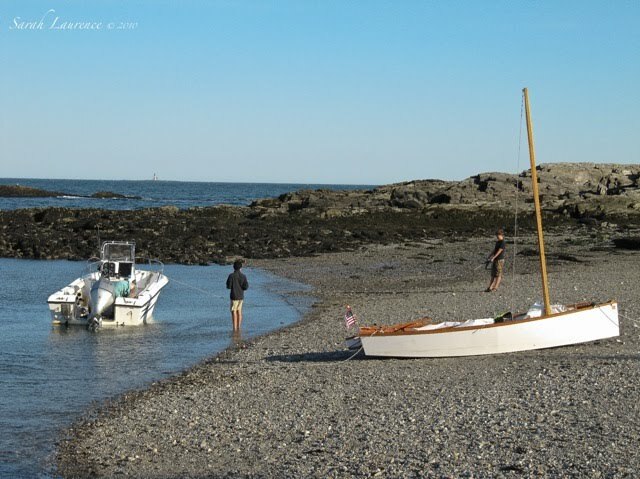 These lovely photographs remind me of how and why I first fell in love with Maine . . . through Robert McCloskey's books. Sapphire, I’m not sure if my painting influences my writing, but the creative process has some parallels. There is certainly something fantastic about Jewell Island. Bee, it’s funny that you would say that. One of my freelance jobs came from a magazine that preferred my photos to those at the Maine Tourist Board. I too grew up loving Maine thanks to McCloskey. I visited Maine for the first time as an adult, and it’s one of the few places that lived up, if not exceeded, my expectations.